September 27, 2017 – (New Haven, CT) A new national study finds that Latinos in the United States are more convinced global warming is happening and human-caused than their non-Latino counterparts. They are also more worried about it, supportive of climate change policies, and willing to take political action. Nearly three in four Latinos want industry, citizens, President Trump and the U.S. Congress to do more to address global warming. The report, Climate Change in the Latino Mind was released today by the Yale Program on Climate Change Communication. 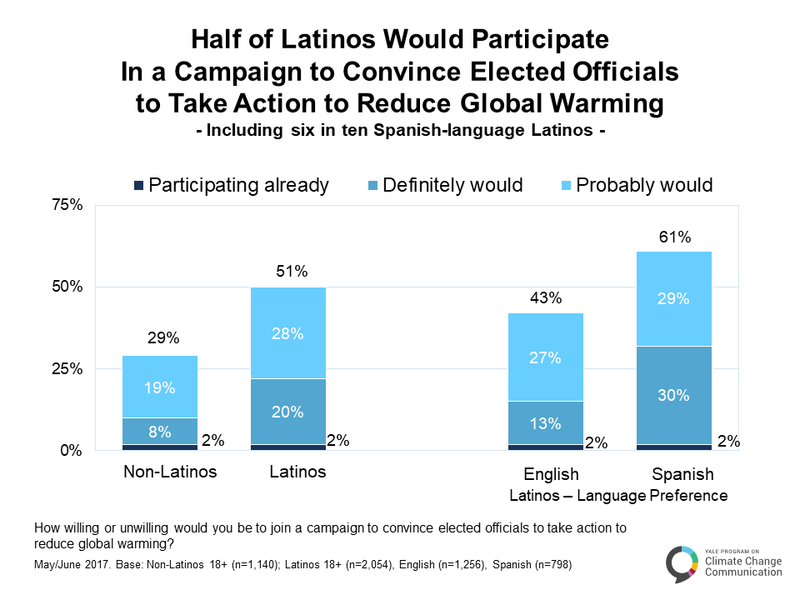 Seven in ten Latinos (70%) understand global warming is mostly human caused, including three-quarters of Spanish-language Latinos (76%). Results for Latinos are based on a nationally representative survey of Latinos in the U.S. (n=2,054) conducted by the Yale Program on Climate Change Communication on the GfK KnowledgePanel Latino®. Interview dates: May 18 – June 8, 2017. Respondents chose whether to take the survey in English or Spanish. Results are reported for English- and Spanish-language preference according to respondents’ survey language choice. The research was funded by the Heising-Simons Foundation. Results for non-Latinos are based on findings from a nationally representative survey of U.S. adults (n=1,266) conducted by the Yale Program on Climate Change Communication and the George Mason University Center for Climate Change Communication on the GfK KnowledgePanel®. Interview dates: May 18 – June 6, 2017. The research was funded by the 11th Hour Project, the Energy Foundation, the Grantham Foundation, and the MacArthur Foundation. In addition to Dr. Anthony Leiserowitz, principal investigators included Drs. Seth Rosenthal and Matthew Cutler of Yale University. The Yale Program on Climate Change Communication conducts scientific research on public climate change knowledge, attitudes, policy preferences, and behavior. Our mission is to advance the science of climate change communication, help leaders communicate more effectively, and increase the public’s understanding of climate risks and opportunities.